This is not another fad weight loss method that involves you starving or fasting your way to the best look ever. And its not about which shampoo you use or which conditioner or oil treatment works best either! This is about which foods (or supplements) can have a beneficial effect on your hair and scalp as well as your over all wellbeing. It’s easy to forget that hair is a living part of our body. Most people simply don’t make that association. But as such, it must be nourished with specific nutrients. It is also easy to believe that to improve the quality of our hair we only need to use good quality sham­poos, conditioners and cosmetic products. While high quality hair products that are not harsh or abrasive are certainly important to improve the shine and look of our hair, they can never effectively nourish the hair root and shaft for new hair growth and quality. Even though it seems like one complete structure, hair is actually made up of a number of different components. The hair follicle is a small pocket just below the skin surface surrounded by nerves and, when healthy, a supply of rich nutrient-filled blood. 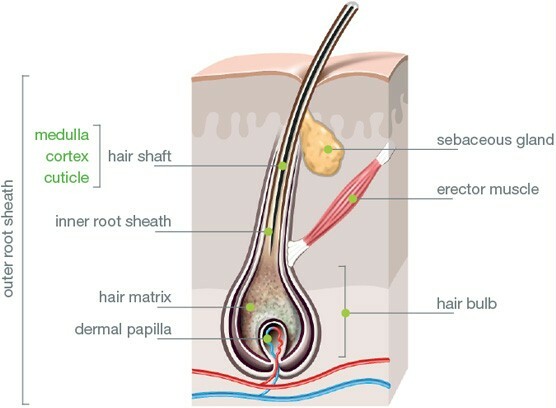 Within the follicle is a hair bulb and the papilla, which supplies the growing hair with nutrients. This tiny hair growing factory also contains a small muscle which responds to cold or fright and gives us those familiar goose bumps. In addition, the follicle contains an oil producing gland called the sebaceous gland. This gland produces a fine, natural oil which coats the growing hair and protects it from loss of moisture. The hair shaft is what we see and its exposed as it leaves the surface of the scalp. The shaft consists mainly of keratin, a hard protein similar to that of our nails. Keratin is very strong and supple and has great resis­tance because of a high content of sulphurated amino acids. The second part of the hair shaft is the cuticle, a horny, scaly, outer layer that protects the inner protein fibers. It consists of overlapping scales like those of a fish. 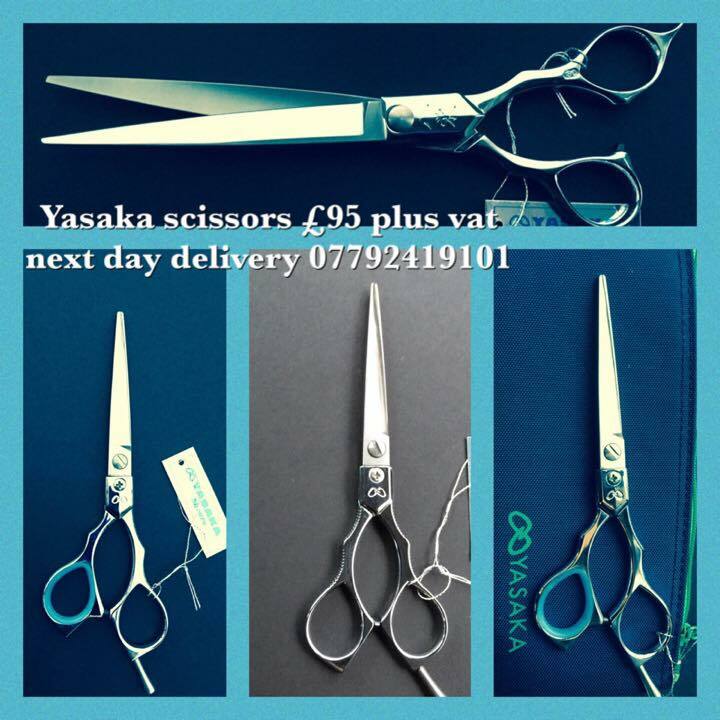 When the scales lie flat the hair is reflective and shiny and protected from damage as well as free of tangles. The cuticle also protects the inner hair partially because it acts as a trap for sebum, the natural oil produced by the sebaceous gland. 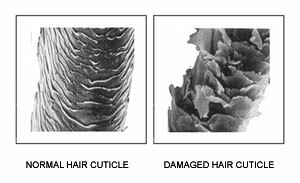 If the cuticle becomes damaged and breaks away, the inner fibers will fray leading to breakage and split ends. Underneath the cuticle is the next layer called the cortex. It is made up of millions of keratin fibers twisted around each other like a rope. This cortex is responsible for the thickness and strength of the hair and contains pigment that determines your natural hair color. 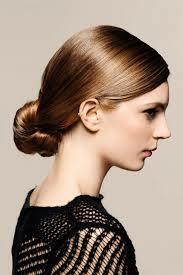 In the very center of each hair is a canal made of soft keratin called the medulla. Its function is unknown. Sometimes the medulla is missing altogether, and it’s believed that poor health and unbalanced nutritional intake is responsible for its disappearance. In fact, when the body is undernourished, it shuttles nutrients to the most critical lifesaving organs and glands. Anything “non-essential” – including hair – is basically starved of nutrition. And in reality, that makes perfect sense. Our hair has very little to do with improving the quality of our health, and that’s why it is sacrificed by the body to protect more critical functions. To keep hair healthy, we know that regular shampooing, conditioning and other external treatments are usually part of the routine. To really nourish and sustain healthy hair growth a diet which contains high levels of the fol­lowing active ingredients are equally important. A side effect of these simple diet choices is the possibility of better health. Sulphurated amino acids.Two of these sulphur amino acids for new hair growth are L-methionine and L-cysteine. These are the basic building blocks of hair, they are essential for the formation of keratin and promote hair growth. B Vitamins. B vitamins, necessary for virtually every function in the body, also contribute to healthy hair and skin. The B vitamins that need to be a part of a hair renewing formula include riboflavin, B6 (as Pyridoxine HCl), folic acid, pantothenic acid (B5), and biotin. While they all have a role, I’d like to focus on two of them: vitamin B6 and biotin. Vitamin B6. This vitamin plays an important role in the absorption of the sulphurated amino acids, those building blocks of healthy hair that I mentioned before. Interestingly, there has been recent scientific research that shows that vitamin B6 and l-cysteine helps prevent alopecia (hair loss) induced by chemotherapy. While there is more work to be done on this front, I think the indications are very hopeful. Biotin is another B-vitamin that is a must for healthy hair and skin. It is found in a number of food sources, including egg yolks, milk, barley, liver, royal jelly and brewer’s yeast. For the full benefits, a supplemental source is best. Biotin helps the body synthesize and use fatty acids and metabolize amino acids. It helps DNA replicate properly, so it an extremely necessary nutrient for a variety of reasons. Those born with metabolic disorders can be prone to severe biotin deficiencies, and suffer from alopecia as a result. However, anyone following the standard American diet of refined foods needs a strong source of the nutrient to help build the structure of keratin for strong hair and nails. In fact, a Swiss study found that 63 percent of those using a biotin supplement showed a 25 percent increase in nail thickness when they previously had dry, brittle fingernails. Biotin deficiency is serious. If you have alopecia, dermatitis, or weak nails, you definitely need this B vitamin. Millet Seed Oil Extract. Supercriti­cal (CO2) millet (Panicum miliaceum) seed oil extract is processed with no harsh chemicals – only carbon dioxide. This helps preserve the seed oil’s natural valuable compounds, including linoleic acid, miliacin, and other plant sterols that are crucial for sustaining hair growth. While each component of millet seed oil extract is important, miliacin is the heavy hitter. It increases cell metabo­lism, and stimulates cell proliferation and tissue regeneration – exactly what you want for restoring healthy hair. Miliacin is backed by clinical studies that show that it supports the formation of lustrous and healthy hair. It also activates the body’s own repair mechanisms to heal skin and reduce inflammation. In a clinical study, cancer patients were divided into groups receiving millet seed soil extract and chemotherapy, or chemotherapy alone. The grade, or severity, of hair loss was assessed by World Health Organization (WHO criteria). Those in the millet seed group saw significantly lower percentages of hair loss. The extract, given orally, was well tolerated in all patients – a challenge when chemotherapy is part of the treatment. Certainly, more work needs to be done to establish effectiveness and timing (how early before chemotherapy treatment to begin using the extract), but these results are still reason for hope. Sunflower seed oil. This excellent oil provides valuable omega-6 fatty acids that are necessary for healthy hair. Sunflower seed oil also contains lecithin, phospholipids, tocopherols, carotenoids and has a very high content of vitamin E. It helps retain mois­ture in the skin and hair, and may provide a protective barrier as well. Silica. A lack of silica can lead to skin, nail and hair disorders as well as growth problems. But how often do you get silica through dietary sources? Probably not very often. The silica I recommend is an organic ingredient obtained from the above-ground parts of the common horsetail (Equisetum arvense) plant. In a special process, the silica in the plant is extracted while still attached to the plant bioflavonoids that support its activity in the body. At the same time, all the harsh and potentially harmful substances are screened out using this gentle process. This unique botanical silica is then blended with a specific marine oil to enhance absorption, beneficial effects, and cell membrane penetration of the active compounds. This form of silica is extremely soluble and virtually 100% bioavailable for the body. While there are other supplemental sources that are either mined from rock or synthesized in a lab, they are not the same. To begin with, plant-derived silica has higher levels of bioactivity than all other forms. In fact, the stem of the common horsetail plant is about 80% silica ! These nutrients are exactly what you need for strong, lustrous hair growth. Plus, because it is hormone-free, it will not cause undesirable hair growth on other areas of the body. It is a safe and natural way to encourage healthy hair, regardless of gender or age. My only other advice is to be patient. Stick with these nutrients for at least three months. New hair growth may respond very slowly and while you may see results with greater beauty and thickness, allow ample time for new hair to grow in as well. I think you’ll be happy with the results.